282 pages | 100 B/W Illus. The dynamical projectors method proves to reduce a multicomponent problem to the simplest one-component problem with its solution determined by specific initial or boundary conditions. Its universality and application in many different physical problems make it particularly useful in hydrodynamics, electrodynamics, plasma physics, and boundary layer problems. A great variety of underlying mechanisms are included making this book useful for those working in wave theory, hydrodynamics, electromagnetism, and applications. 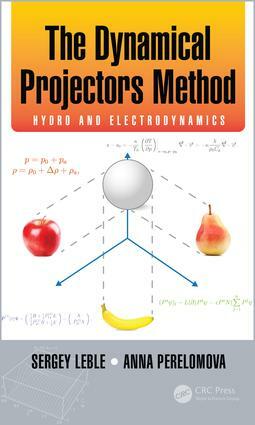 "The authors developed a universal and elegant tool – dynamical projector method. Using this method for very complicated hydro-thermodynamic and electrodynamics problem settings, they were able to get a lot of interesting analytical results in areas where before often just numerical methods were applicable." "The book is intended for professionals working in various fields of linear and nonlinear mathematical physics, partial differential equations and theoretical physics. The book is written clearly, and in my opinion, its material will be useful and easy to understand for professionals and for students familiar with ordinary and partial differential equations." Prof. Sergey B. Leble received his Ph.D in 1974 from Leningrad State in St. Petersburg, Russia with a focus on theory of elementary particles and curvature. In 1987 he received his Dr. hab. from Leningrad State University with a focus on waveguide propagation of nonlinear waves in layered media, followed by a professor diploma in 1989. He has published 7 books, contributed many chapters in collective monographs, and published over 200 scientific journal articles in the field of theoretical and mathematical physics as well as applied mathematics. He is now a Professor of Kant Federal University in Kaliningrad, Russia. Prof. Anna Perelomova was born in Moscow in 1965. After graduating from a high school in 1982, she began studying in the Department of Acoustics at the Physical Faculty of Moscow State University where she specialized in radiophysics and received a degree with honors in 1989. Her doctoral thesis "Acoustic-gravitational waves induced by a powerful source" was awarded in 1994 by the Institute of Physics of the Earth in Moscow. Anna Perelomova defended a habilitation thesis "Interaction of acoustic and non-acoustic modes: theoretical aspects of nonlinear acoustics" in 2006 for the Department of Physics at the university named after A. Mickiewicz in Poznan, Poland. Since 2011, she has served as a professor in the Department of Technical Physics and Applied Mathematics at the Gdansk University of Technology in Poland and is the author of approximately 90 publications in the field of nonlinear hydrodynamics and acoustics.